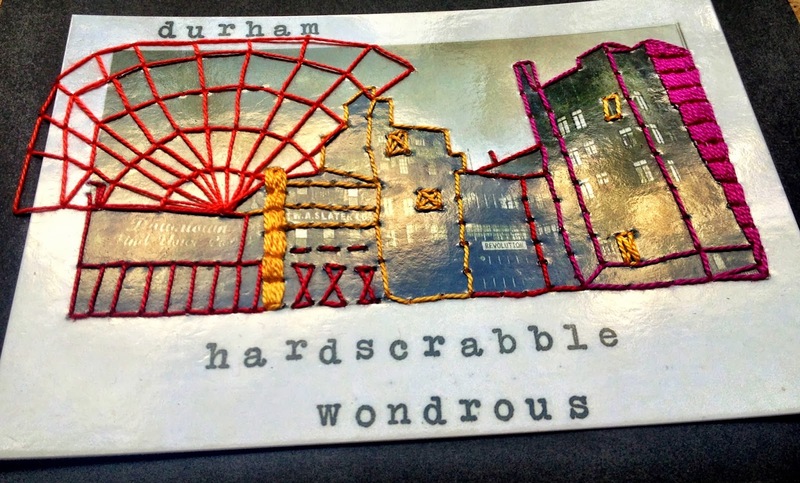 Egads, I hit the swapping jackpot in the latest Phat Quarter Swap. 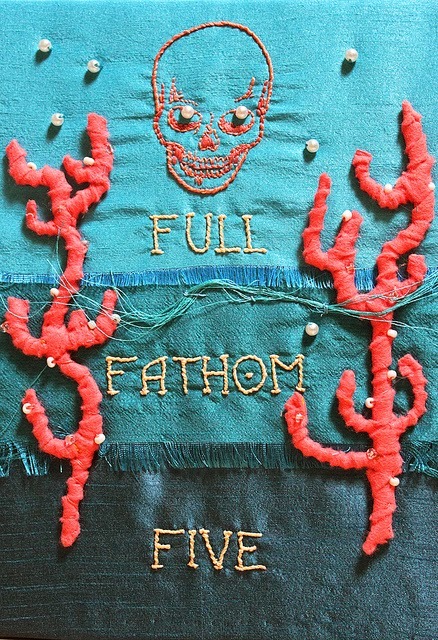 Full Fathom Five, 2013, by Bridgeen Gillespie. 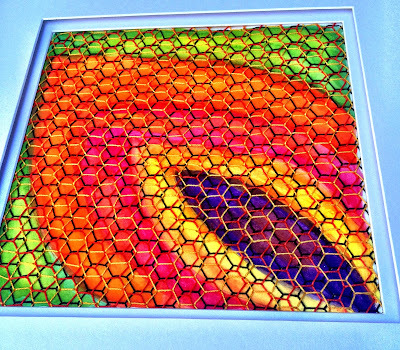 Check out this gorgeous artwork I received from artist Bridgeen Gillespie. 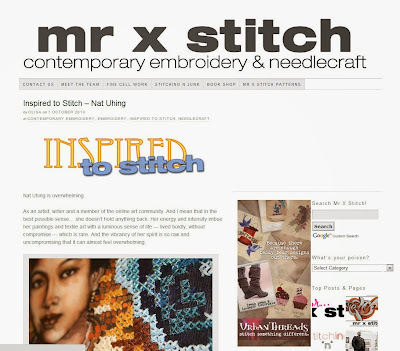 The theme for this swap was simply the number five, which I selected to commemorate the fifth anniversary of the Mr X Stitch web site. A fellow poetry enthusiast, she took inspiration from Ariel's Song from The Tempest. Side view. Photo by Bridgeen Gillespie. 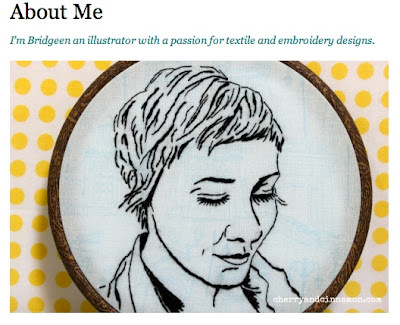 An illustrator, fabric designer and all-around creative goddess, Bridgeen lives in Northern Ireland and is the owner/director of the design company Cherry and Cinnamon. 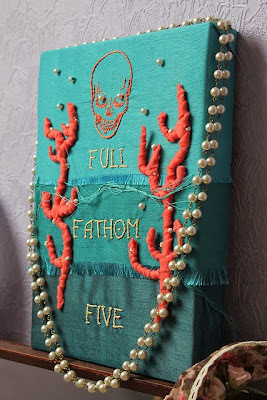 I adore the texture of the layered fabric and the wrapped coral. 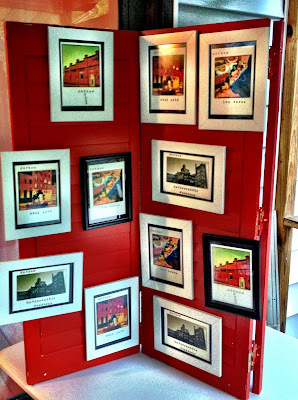 Images of Ireland by Bridgeen Gillespie. 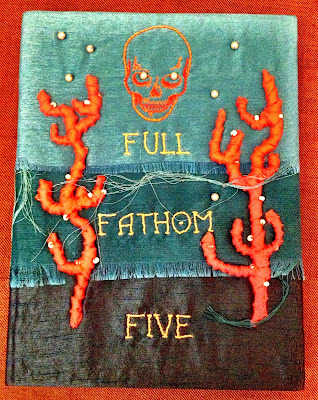 As a phrase,"full fathom five" means that something below five fathoms of water. That is, drowned. Lost to sea. I see oceanic inspiration in Bridgeen's work, most obviously in this gorgeous post card from her "Images of Ireland" collection that accompanied Full Fathom Five on its journey across the Atlantic to me. Stitched Selfie by Bridgeen Gillespie, from her website. 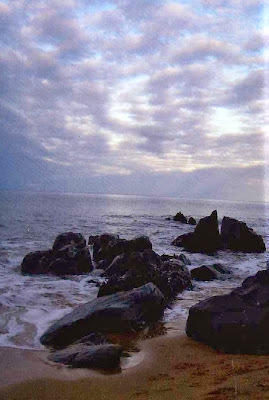 Indeed, the sea is "rich and strange." 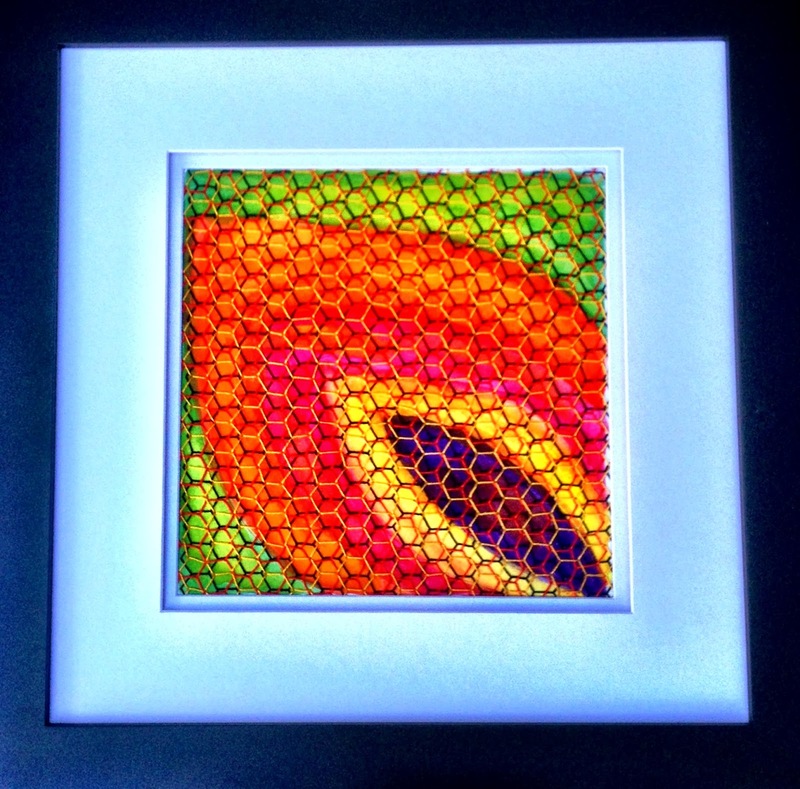 As is so much of Bridgeen's artwork. As is so much that I find beautiful in this world. Making art and exploring your creativity can be surprising. 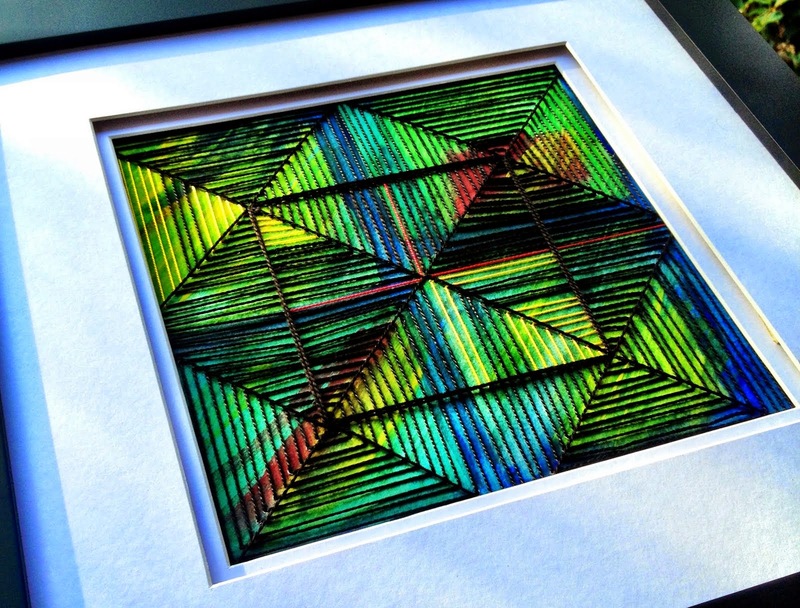 When 2013 started, I had no idea that I would be so taken with stitching into watercolors on heavy weight paper. Now I'm totally fascinated by this combination and I can see myself exploring and layering the two mediums for a long time to come. 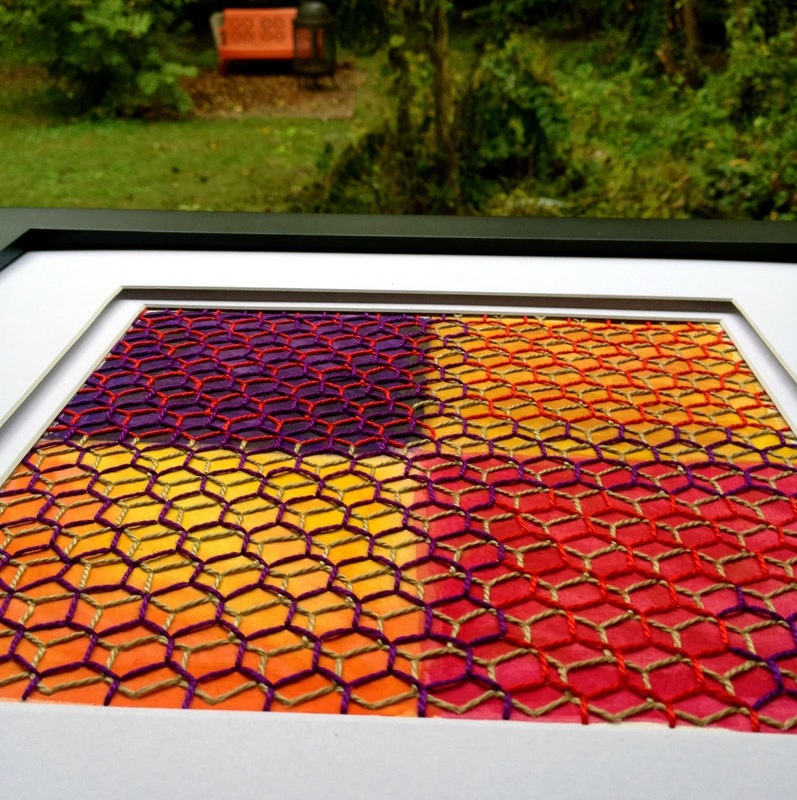 Honeycomb Five recently made its harrowing journey to the U.K. Here is the piece I made for the fabulously talented Sophie Tomlinson for the most recent Phat Quarter Swap for Mr X Stitch. 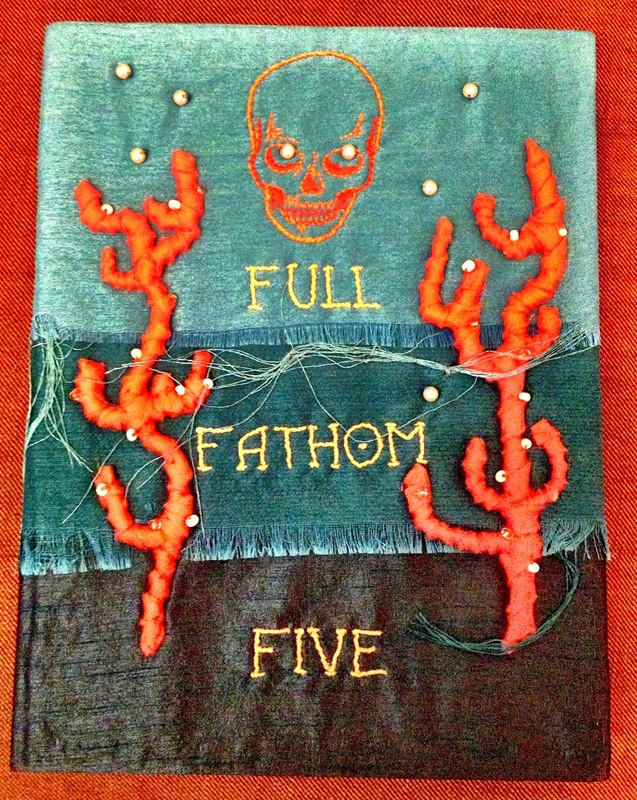 The theme of this swap was "five," to commemorate the fifth anniversary of the Mr X Stitch website and community. Isle of Wight, 2012. Sophie Tomlinson. I've been hosting the Phat Quarter swaps for about a year. 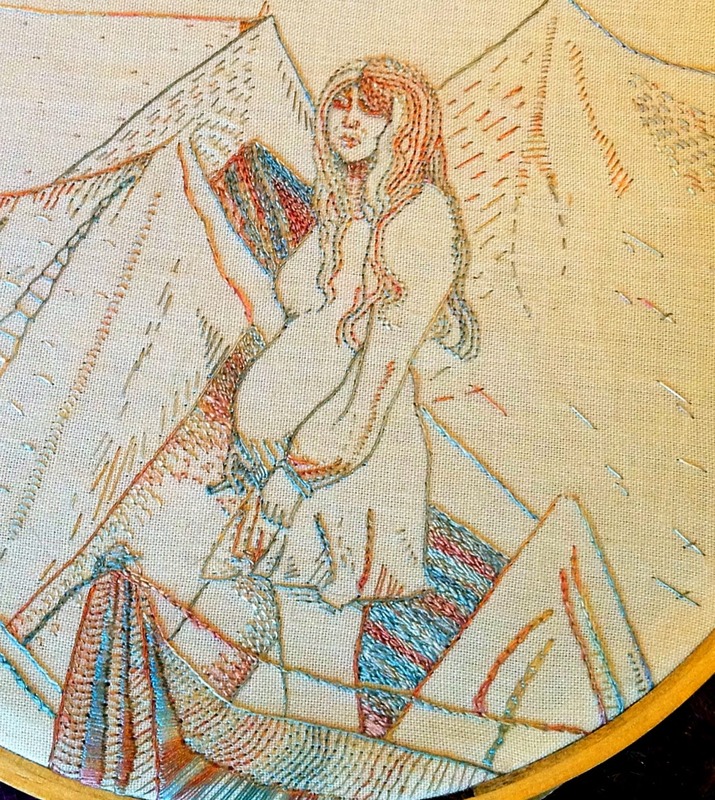 Sophie made on of my all time favorite pieces, the Isle of Wight, which I received as part of the 1970s-themed swap. 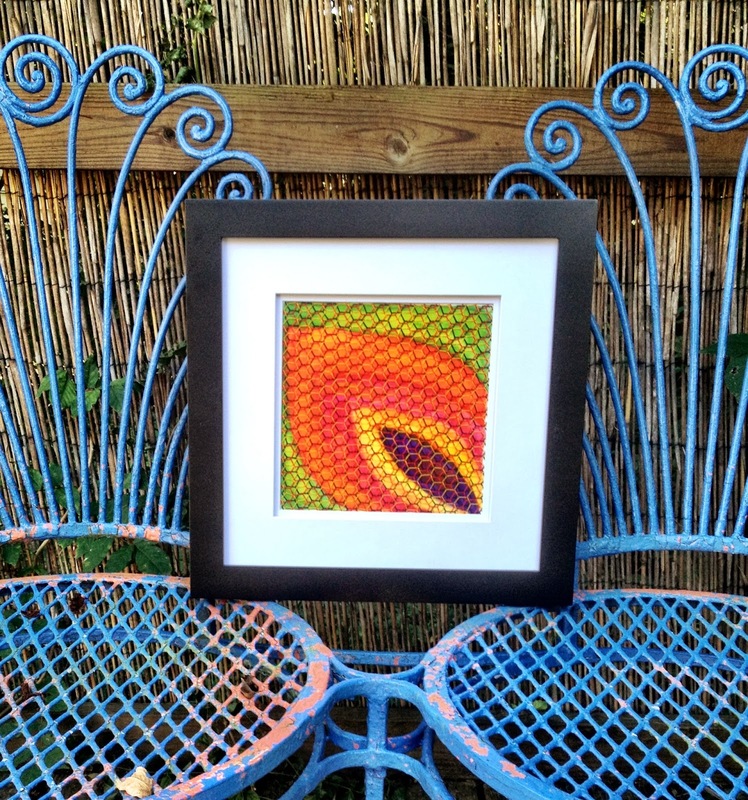 I'm beyond pleased (and relieved) that Sophie likes the piece I made for her. 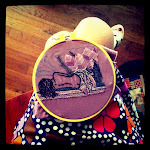 I so admire her work... it was a little scary to make something for her. Thank you for all of the encouragement and kind comments and emails when I confessed my blueness last week. I'm not sure what was going on, but things are much improved. Sunshine helps. 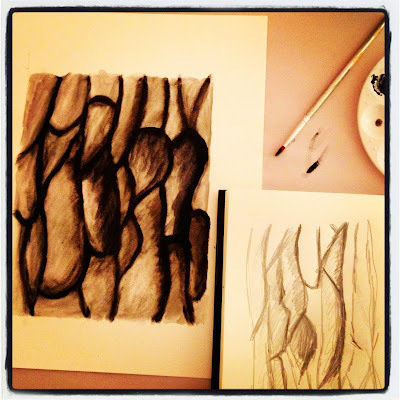 Sketching and painting new images to stitch. Back to my creative life. 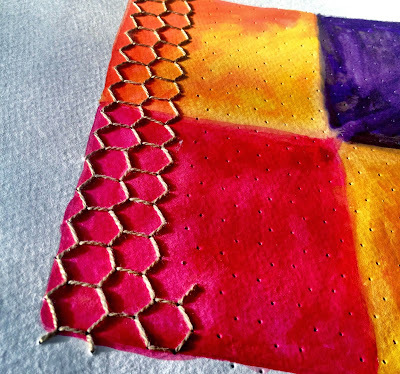 I would may start adding new textures and imagery onto the watercolor pieces. In particular, I'd like explore layering in image transfers. 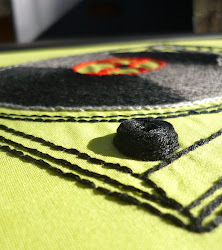 But for now, more stitching and experimenting with these two elements. 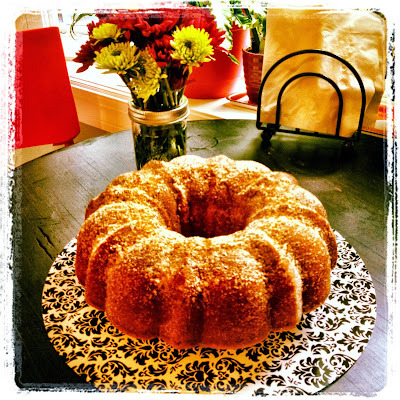 apple cider donut cake. Yum! 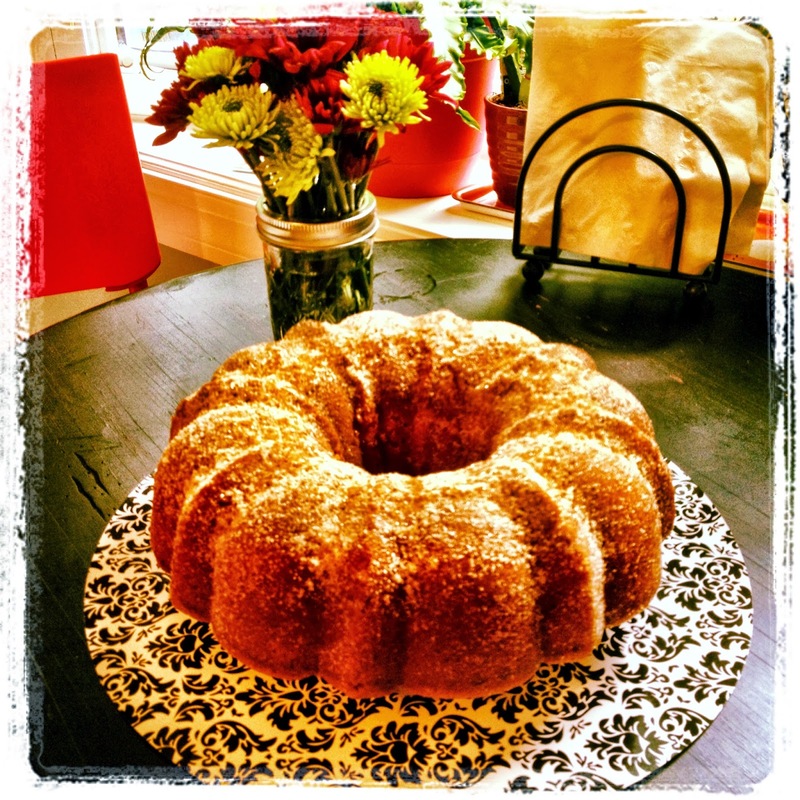 Not art, but creative, edible love. Next, I'll show you the amazing piece I received from Bridgeen Gillespie (a.k.a. the creative goddess behind Cherry & Cinnamon) that crossed the Atlantic to find me. It's amazing! From my back porch. 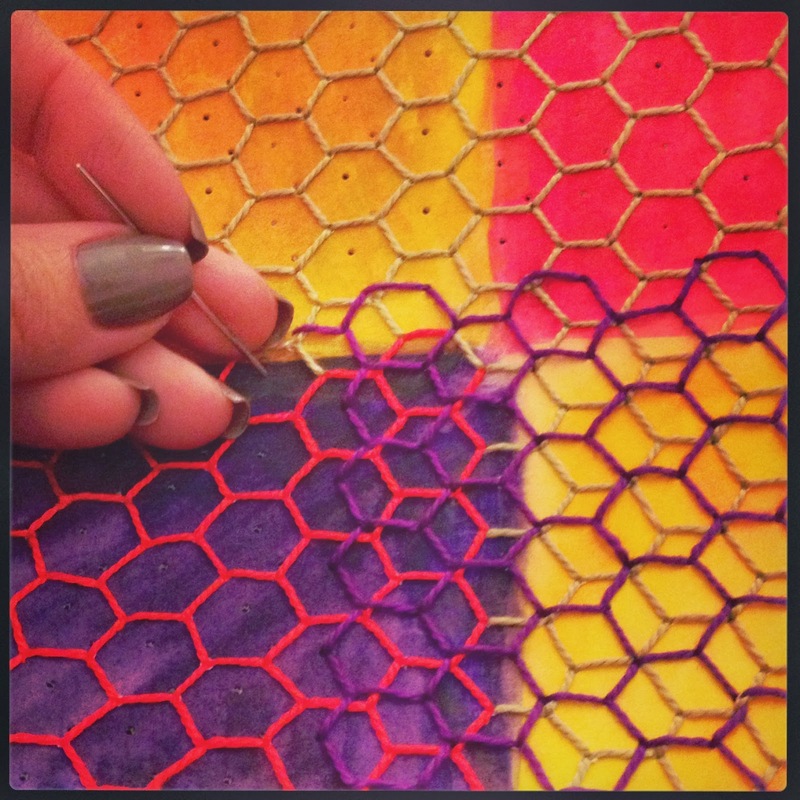 Buh Honeycomb, 2013. Feeling a little meh these days. A little more isolated and alone than usual. Fighting the blues. Buh Watercolor, 2013. 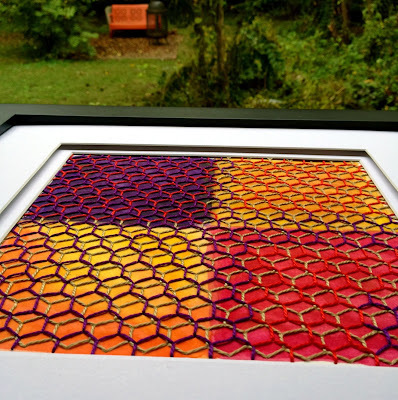 Watercolor, paper, hand embroidery. I finished another watercolor and stitching piece. This one with more muted colors. I like the way you can see the texture of the work when there are fewer colors to take in. It's a little more stripped down. The limited color palette lets me see more of the texture. The blues slow me down. WIP. 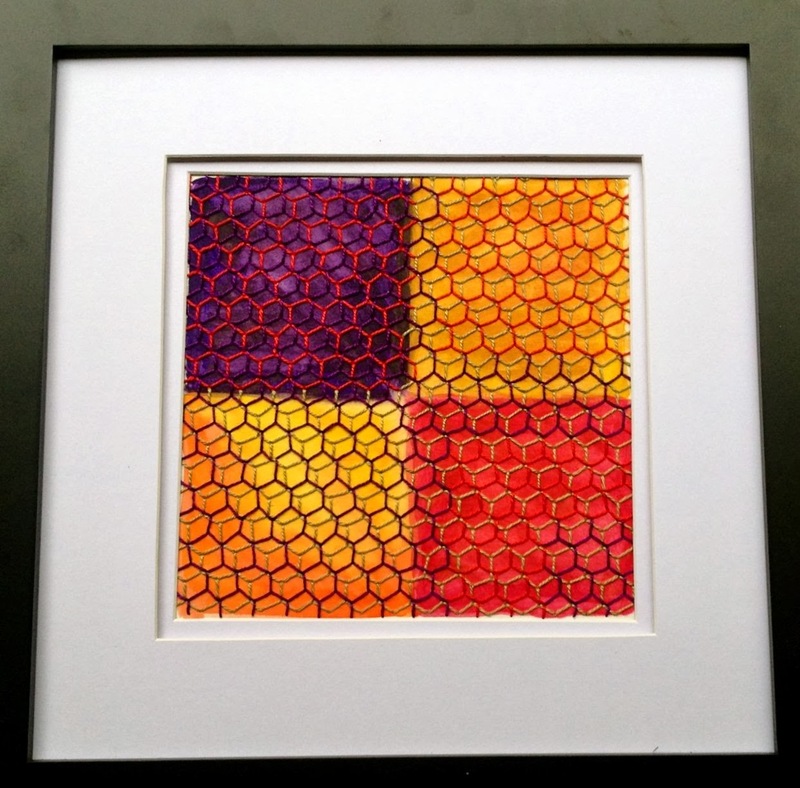 Buh Watercolor Honeycomb, Watercolor, paper, hand embroidery. 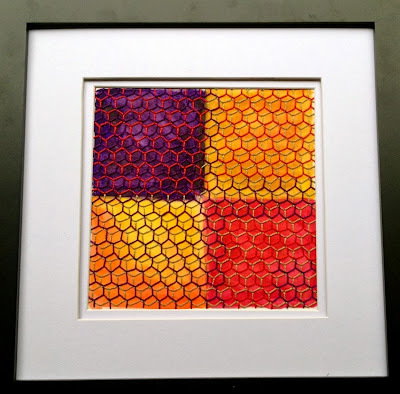 I mentioned in an earlier post that I received some advice about using color from a painter who is incredibly skilled with color. 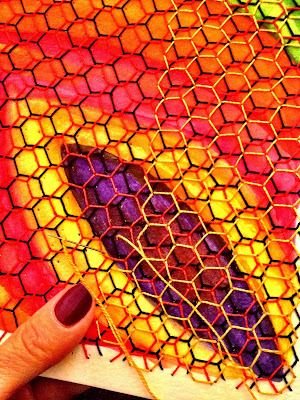 I'm taking her advice to heart and trying to use what she calls "buh" colors, which are more muted, in my honeycomb watercolor stitching. So far I like where this is going. 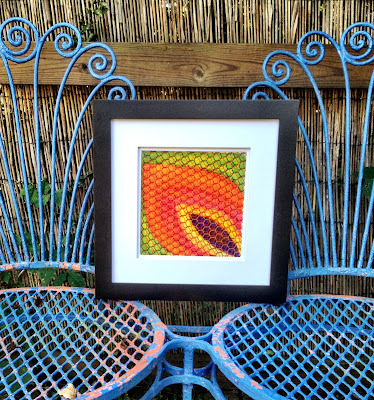 Received a wonderful compliment today: Fellow fiber artists told me that my watercolor stitching looks much better "in person" than it does in photos online. 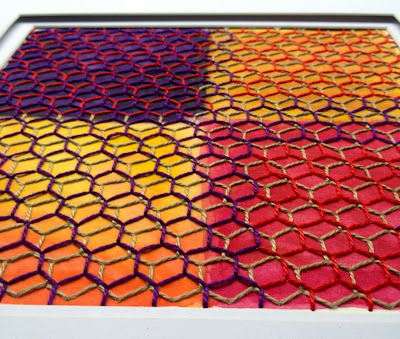 They said that they can appreciate the color and texture so much more. This made me insanely happy. 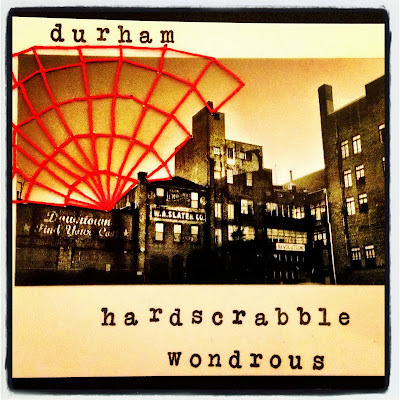 As if Durham needs more whimsy! 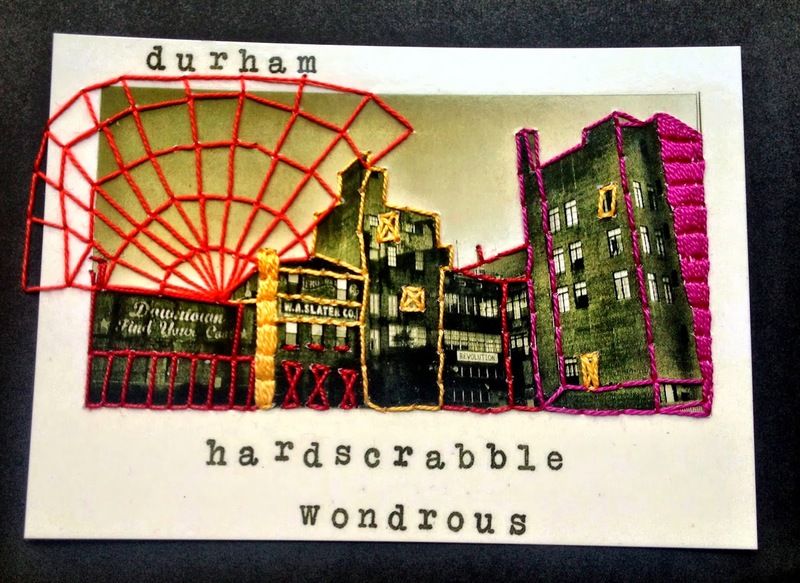 I'm still experimenting with the stitching on my postcards. Here is a WIP of my first attempt. I'm not sure where this is going... but I'm on board. So, the market wasn't what I'd hoped, but that's OK. 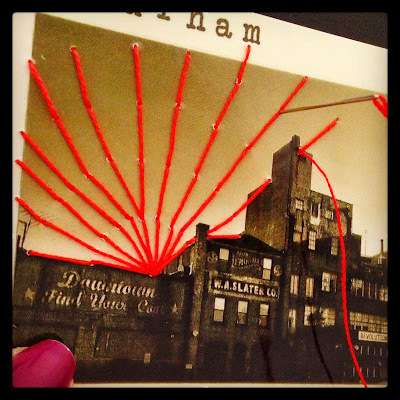 I'm not entirely sure I'm a craft fair kind of girl, but I will explore other market options. Painted shutter display for Hardscrabble & Wondrous sale. Ultimately, it was a gorgeous, sunny day, I met interesting people and spent fun time with my parents and friends. So I can't complain. WIP, Stitched postcard. Spider wheel in the sky. 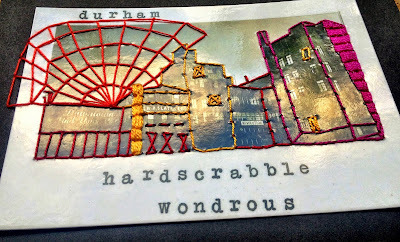 It was only a matter of time until I united my Durham cards with stitching. Lots of possibility for fun with this. I kind of like this work in progress. I will spend some time on this. 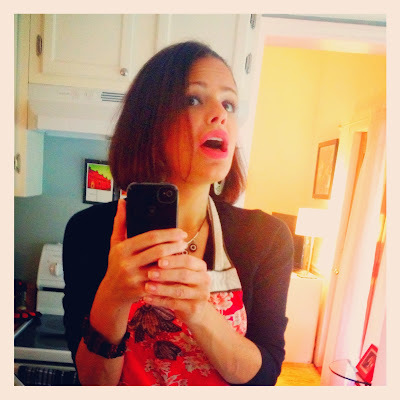 Goofy hostess selfie keeping my chin up. And I will have friends over to my tiny home and spoil them with good conversation, food and drink. And I'll keep my chin up, no matter what.